When Odell Beckham Jr. looked at his phone before dinner last month and saw he was getting a call from Giants general manager Dave Gettleman, he knew something was up. Their brief conversation let him know that he had been traded to the Browns. On Monday, Beckham arrived at his new home in Berea, Ohio, apparently having come to grips with his new situation. 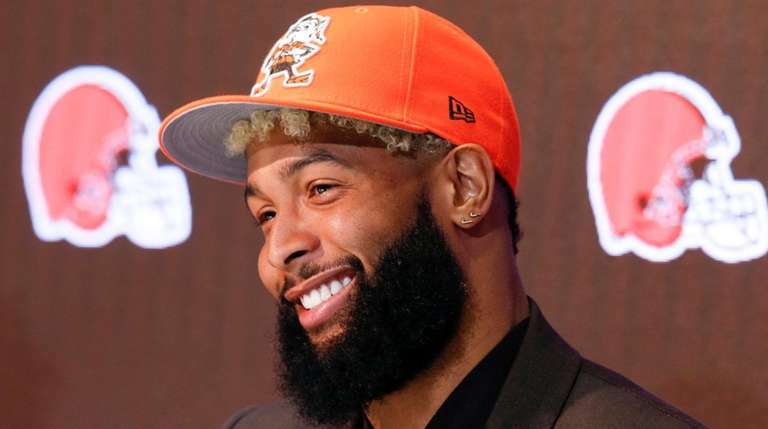 Speaking publicly for the first time since the March 12 deal, and flanked by new teammates Jarvis Landry and Baker Mayfield at a news conference on the Browns’ first day of their offseason training program, Beckham said he is thrilled to be a Brown. “I think this is the biggest blessing of my entire life,” he said. Beckham did not speak much about the team he left behind, although he did reference a recent conversation he had with close friends Sterling Shepard and Saquon Barkley. He also spoke about the “love” he already feels in the Browns’ facility, saying several times how “different” it is. When asked if being traded will add “fuel to his fire,” Beckham simply nodded yes. “That’s all I’m going to say,” he said. The Browns, meanwhile, are thrilled to have Beckham not only on the roster but with them for the start of their offseason program. Coach Freddie Kitchens said he was joking last week when he said his first words to Beckham upon seeing him at the facility would be “I love you,” but he wound up sticking to that line and threw in a hug. Beckham said he loved him right back. “It’s like a love story,” Kitchens said. Landry spoke about how he cried when told about the trade that brought longtime friend and college teammate Beckham to the Browns. “I feel like we spoke this into existence,” Beckham said. Mayfield spoke about how he screamed when he heard the news. Mayfield and Beckham had worked out together in California last offseason, brought together by Shepard (who played with Mayfield at Oklahoma). “The thing we kept saying was ‘this can’t be real,’ ” Mayfield said of their phone conversation shortly after the trade. Beckham said he already has spoken with LeBron James about Cleveland. He knows that James brought a championship to the city with the Cavaliers, and Beckham said he wants to do the same for the Browns. That’s something no one has been able to do since 1964. The team’s, and his own.